Hello! If you're checking out this page it might be because we've asked for the rights to a photo or video you shared on social media. Why are you asking for the rights to my photo/video? Because we love the picture/video you took! And we hope you'll allow us to potentially share it with the world to inspire people to visit Phoenix. Where and how will you use the photo/video? We may just be looking to share the photo/video on our Instagram feed. 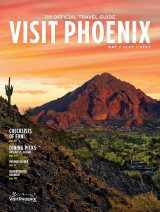 Other places we may use the photo/video include but are not limited to our social media channels (including Instagram, Facebook and Twitter)—in both organic and paid posts—, here on VisitPhoenix.com, our annual travel guide and/or meeting planner guide, and digital ad placements. Why do you say "potentially share it" and not "definitely share it"? Marketing plans can evolve and we may not use it where we originally had in mind or we may use different content in a placement instead. Will you let people know it's my photo/video? We'll definitely give you credit by displaying your username, name or image when and where we can, but a limited number of placements may not allow for it. We will as often as we can, though. Will you edit my photo/video? Some placements may require us to crop the photo/video to better fit in the display dimensions or otherwise make changes, but we'll always try to keep the editing to a minimum. You took a great picture/video and we don't want to mess with it! Terms and conditions for content providers to Visit Phoenix, VisitPhoenix.com. Visit Phoenix is a non-for profit organization headquartered at 400 E. Van Buren St., Ste. 600, Phoenix, AZ 85004, USA. By replying to the request of Visit Phoenix to participate in CrowdRiff (content aggregation tool) with the hashtag #yesVisitPhoenix, you agree to all the terms and conditions in this agreement (“Terms and Conditions” or “Agreement”). Visit Phoenix, which does business using the domain name VisitPhoenix.com, also agrees to abide by these Terms and Conditions. Visit Phoenix may terminate its websites or its use of your content at any time at its sole discretion. Any attempt by you to change any of the Terms and Conditions is hereby rejected, and shall not be made part of the Terms and Conditions unless expressly agreed to in writing by an authorized representative of Visit Phoenix. You must be 18 years of age or older and have the legal right to enter into this agreement and to grant any and all rights to your name, username, and image (collectively "Name") and user-generated content (“Content”) in the form of original photography, video or text. You understand and agree that your Name and Content will be publically displayed, and that it will not be treated in confidence. By replying to Visit Phoenix’s request to participate, you provide Visit Phoenix with the unlimited, worldwide right to use and share your Name and Content on its website, VisitPhoenix.com; in all of its social media channels, such as Facebook, Twitter and Instagram, including both organic posts and paid ads; its printed marketing materials such as the annual Official Trail Guide, the annual Meeting and Travel Planner Guide, Visit Phoenix Trail Guide, and more; digital ads; and other promotional materials of any kind or type. You agree that you are solely responsible for your Content. Visit Phoenix is not required to host, display, or distribute any Content on or through its websites, on social media or otherwise, and may remove Content at any time or refuse Content for any reason. Visit Phoenix is not responsible for any loss, theft, misuse or damage of any kind to your Content. You own all rights in and to your Name and Content including without limitation, all rights to the audio, video and or digital recording and performance contained in your Content (if any), and/or you have acquired all necessary rights to the elements appearing in your Content to enable you to grant all the rights to Visit Phoenix as described herein. You agree to release and allow all creative license and creative treatment in the use and production of your Content at the discretion of Visit Phoenix and its agents. You will not be compensated or granted any consideration in any way by Visit Phoenix for the use of your Name or Content. Your Content does not incorporate materials from a third party website, copyright-protected materials, or personally identifiable information of anyone other than yourself. Your Content does not reflect negatively in any way upon the city of Phoenix or the marketing, advertising, commercial or promotional efforts of the city of Phoenix or Visit Phoenix. You irrevocably release and forever discharge Visit Phoenix and its agents, directors, officers, affiliated entities, employees, contractors and third party providers (“Released Parties”) from any and all actions, claims, damages, liabilities and demands, whether absolute or contingent and of any nature whatsoever, which you now have or hereafter may have against any of the Released Parties, or their respective successors or assigns, arising out of or related in any way to use of your Name, Content or anything contained therein. You agree to indemnify, defend and hold harmless Visit Phoenix and its agents, directors, officers, affiliated entities, employees, contractors and third party providers (“Indemnified Parties”) from and against any and all claims, liabilities, damages, losses, costs, expenses or fees (including reasonable attorney’s fees) that any of the Indemnified Parties may incur arising out of or related to the Name, Content or your breach of this Agreement. Visit Phoenix reserves the right to assume the exclusive defense and control of any matter otherwise subject to indemnification by you, and you agree to cooperate with Visit Phoenix’s defense of such claims at your own expense. Visit Phoenix may, at its sole discretion, change these Terms and Conditions at any time. Any changes will be posted on https://www.visitphoenix.com/hashtag-rights-request-terms-and-conditions/ and will be effective upon posting unless another effective date is specified. Should you want your Content removed from Visit Phoenix’s website, you will need to send a message to the following: gpcvbmarketing@visitphoenix.com. After Visit Phoenix acknowledges receipt of your email request, please allow 30 days for action to be taken, though Visit Phoenix reserves the right to deny any such request. You must not incorporate any content from this site into your site or social media channels by in-lining, framing or creating other browser or border environments around the website content. You may only link to, not replicate, the content on the websites of Visit Phoenix. You may not use any Visit Phoenix intellectual property, including Visit Phoenix’s trademarks, logos, designs or service marks in your links. You may not create the appearance or impression of a relationship or affiliation between you or any third party and Visit Phoenix. Your site or social media channels may not, in the sole discretion of Visit Phoenix, contain offensive, distasteful, illegal or inappropriate content. If you would like to use a web crawler or other search tool to gather information from Visit Phoenix’s website(s) you must comply with the provisions of the robots.txt file of the site and you may not circumvent CAPTCHA or other security measures. CAUTION: Any attempt by any individual to deliberately damage the Visit Phoenix website, tamper with the aggregation process, or otherwise undermine the legitimate operation of the CrowdRiff program may be a violation of criminal and civil laws. Should such an attempt be made, Visit Phoenix reserves the right to cooperate in the prosecution of any such individual(s) and to pursue all remedies to the fullest extent permitted by law. These Terms and Conditions and the Privacy Statement together with any additional terms to which you agree when using particular elements of the website(s) constitute the entire and exclusive agreement between you and Visit Phoenix.